The new American face at basketball side CB Canarias is no stranger to the Canaries, although his move here is a big step-up in more ways than one. 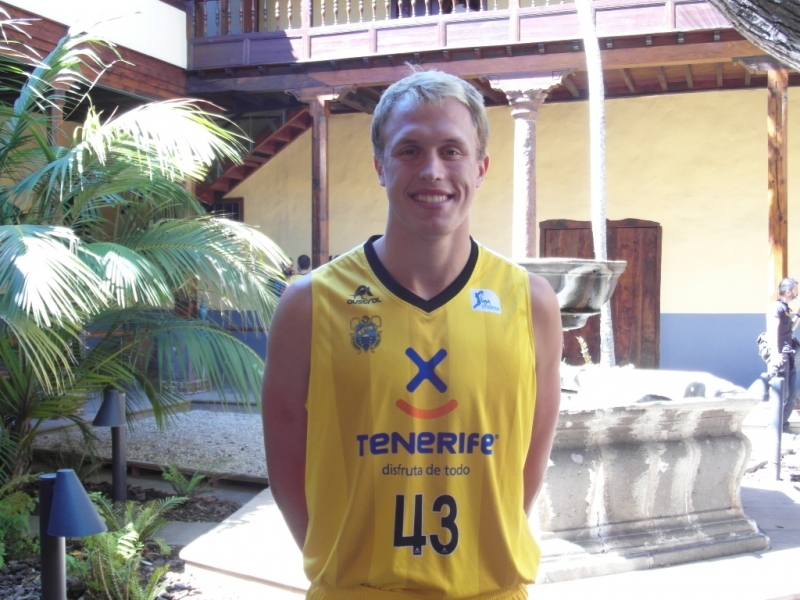 26.10.2013 - Luke Sikma has previous experience of the islands, having lived on La Palma for a year when he played for the local side in the LEB division before moving to the mainland, where he starred for Burgos in their double winning year last season. Financial problems prevented Burgos from taking up their berth in the ACB league to rub shoulders with the likes of Barcelona, Real Madrid and Caja Laboral. However, the 24-year-old did not take long to find another ACB club and he jumped at the chance to sign for La Laguna-based Canarias and return to shores which offer a much warmer winter than his native state of Washington, not far from the Canadian border. Island Connections caught up with him on the eve of the new season, which started last weekend, to see how he was getting on ahead of his first foray into the best basketball league in the world after the NBA, in which his famous father Jack Sikma starred for Seattle and later Milwaukee for many years. It is no coincidence that Luke has asked to wear the 43 jersey at Canarias, the number worn with such distinction by his Dad at Seattle. Settling in here is proving much easier than for most new ‘imports’, as the well-spoken 6 foot8 inch centre with a fondness for shooting three-pointers from the perimeter readily acknowledges. “Having lived in La Palma, I kind of knew what to expect in terms of life in the Canaries. I was really happy to come back and it has certainly lived up to expectations so far. It is beautiful here, the people are really nice and I have already explored the island a little bit. Things are even better on the basketball side and I could not be more happy. I am fitting in well with my team mates and we have a really good group”. Bachelor Luke lives on his own Santa Cruz but the prospect holds no fears for him as, in stark contrast to the stereotype of American players who head straight for a well-known fast-food outlet for sustenance, he is adamant that he will be, “doing his own cooking” and has already familiarised himself with the big food stores near his new lodgings. That said, he openly admits that he will miss his family - his parents and two brothers (one younger, one older) - although he realises that he is not the only one suffering as a result of his exile. “It is tough not just for me but for my Mom also, who is bouncing around visiting my Dad, who is coaching in Minnesota, my brothers in Connecticut and Seattle, and making plans to come out here in November to see me”. Whether or not Luke stays around as long as Rost is not an issue for the moment as he is happy to get the season fully under way and then think ahead. “I want to play at the highest level possible and this is the best outside the NBA. I love it in Santa Cruz and will keep coming to work every day to help the team win. When the time comes I will take a step back and decide on the next stage of my life”.